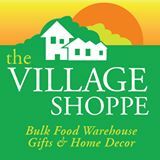 The Village Shoppe/Bulk Food Warehouse is celebrating 30 years serving Amherstburg. Established in 1984 at 473 Sandwich St.S. as the Bulk Food Warehouse, the business offered a large selection of bulk foods, vitamins and supplements. Realizing that there was a need for unique, reasonably priced gift ware, housewares and home decor items in town, the product selection was expanded over the years necessitating a move to a larger premises at 13 Sandwich St. To better reflect the various merchandise offered, it became apparent that a name change was needed, thus “The Village Shoppe” was born. With unique gifts for every occasion, choose from jewelry, fashion, entertaining, birthday, wedding, religious, bereavement, and more. The Christmas merchandise is second to none (including Elf on the Shelf and the new Elf Pets Reindeer and accessories). In the Bulk Food area you’ll find fruit cake, gluten-free and all your baking needs, including a huge selection of Wilton name brand products. Shop early for best selection! Hope to see you soon. Visit us at thevillageshoppe.ca or call 519-736-7455.